Tetris is one of the most popular and ubiquitous video games of all time. No matter how long it’s been since folks played it, the classic puzzle challenge seems to be permanently projected onto people’s brains and eyelids. It turns out that the story of how the megahit game’s creation and dissemination is as captivating as a great Tetris session. 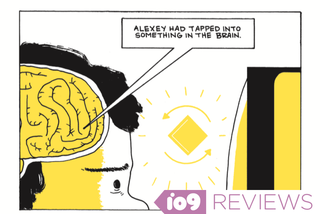 Written and drawn by cartoonist Box Brown and due out in October, Tetris: The Games People Play details the humble side-project origins of Alexey Pajitnov’s iconic video game. The graphic novel isn’t just a blow-by-blow account of inspiration and execution, though; it also seats Tetris inside a philosophical and historical analysis of games’ social importance. Games People Play opens in 1984, showing Pajitnov talking to a friend about a pentamino puzzle he’s obsessed with. Tetris’ beginnings as a diversion from the drudgery of toiling away in a Soviet-era government job is well-known but Brown’s panels add to that narrative by showing how the game’s spread as a humble viral fascination. Brown turns the intrigue surrounding Tetris’ publishing rights into a rollicking series of round-robin skirmishes that touch on the corporate-raider shenanigans and Cold-War tensions of the 1980s. The business-centric portion of the book shows how video game and software publishing was much more of a maverick, unregulated landscape 30 years ago. One of the best parts of the book revolves around Nintendo’s intersection with Pajitnov and Tetris. Brown delivers a great mini-history of the video game giant, with winning sequences centered on the movers and shakers of the company’s early days. The puckish energy of Shigeru Miyamoto and shrewd inventiveness of Gunpei Yokoi all come through in Brown’s panels and the book shines thanks to his talent at communicating personalities through linework and word balloons. There’s bluster, desperation and bluffing aplenty from players like tabloid-media mogul Robert Maxwell, Nintendo lawyer Howard Lincoln and multi-company video-game exec Hide Nakajima. Tetris is a game known to breed obsession in the minds of people who play it and Brow’s graphic novel teems with little details that themselves feel compulsively researched. Specs for hardware, lines of code, biographical curios all get sprinkled on across the 253-page book. Brown metaphorically presents each incremental happening as a random tetromino that Pajitnov and other personas have to rotate to their best advantage. The unsecured handheld-version rights are an S-shaped piece that Nintendo deftly slots into its launch of the first Game Boy while the court proceedings detangling competing contracts unfolds with a tension that’ll be familiar to anyone who’s ever waited for a I-piece for a four-line clear. This is a work about the bittersweet dissonances of artistic creativity and commercial greed and the ephemeral yet crucial joy we get from making things fall into place. If you’ve fallen out of love with the titular game, Tetris: The Games People Play will pull you right back in.